In Hungary, you’ll find the orb-shaped bottle in every bar, but abroad, Unicum morphs into an exotic concoction that some drink for a dare. This near-black bitter liqueur is made from a top-secret recipe of 40 herbs and spices. Some love its herbal bitterness, particularly before or after a meal as a digestive aid, whereas others despise its intensity. The story of Unicum is entwined with Hungarian history and particularly one family’s resilience through war, persecution, and political upheaval. It begins with one Dr. Zwack, the royal physician to the Hapsburg Imperial Court. Legend has it that Dr. Zwack invented the black bitters in 1790 to help Emperor Joseph II’s indigestion. The emperor, so pleased with the liqueur, exclaimed, Das ist ein Unikum! (“This is unique!”), and the name was born. The Zwacks, Hungarian-Jews who converted to Christianity in 1917, built an alcohol empire around their signature drink and kept its recipe strictly within the family. During World War II, Swedish diplomat Raoul Wallenberg saved the Jewish-classified family from concentration camps, but the Zwacks couldn’t save their Budapest distillery from bombs. To keep production going, they worked amidst the ruins of the factory. By the time distillery was restored, the new communist regime confiscated it without compensation in 1948. Most of the Zwacks fled to the United States, taking the real recipe with them and leaving the state to produce an inferior product. After Hungary began its transition to democracy, the Zwacks returned. They managed to buy the distillery back from the state in the 1990s, reinstating the original production of Unicum, which continues in their Budapest factory today. If you find Unicum too bitter for your taste, try the Unicum Szilva, which is made by aging the drink on a bed of dried plums. It has a sweeter taste and goes well with tonic, too. The new Unicum Riserva has a port wine or brandy-like taste that is a far cry from the bitter original. 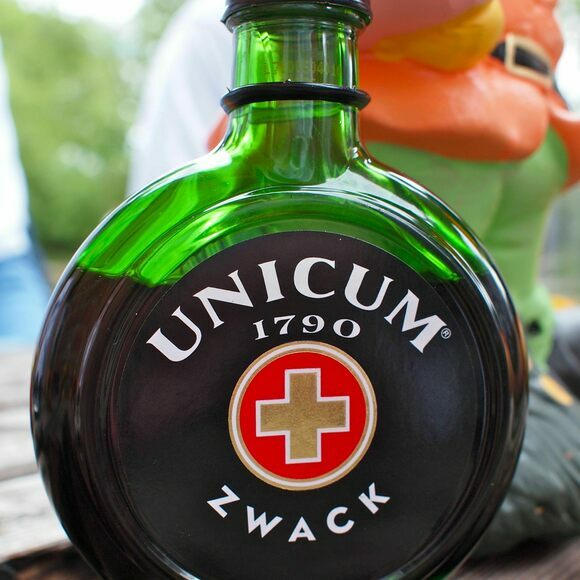 Unicum continues to be distilled and aged in oak barrels at the Zwack factory in downtown Budapest.